"Ghetto no longer refers to where you live, it is how you live. It is a mind-set...a mind-set that thinks the M words -- monogamy and marriage – are bad language...a mind-set that thinks it is fine to bounce, baby, bounce in some video, as if that makes it different from performing such a display on a table, on a pole, on some john's lap, or on the corner. Most of all, ghetto is a mind-set that embraces the worst. It is the embodiment of expectations that have gotten dangerously too low." Have you ever visited the website Hot Ghetto Mess? (http://www.hotghettomess.com/hgm/index.asp) It's a site dedicated to black bad taste which posts hilarious photos and videos of girls and guys gone ghetto. Now Cora Daniels has written a book about the troubling phenomenon in which she bemoans the fact that ghetto style is no longer limited to folks living in the slums. 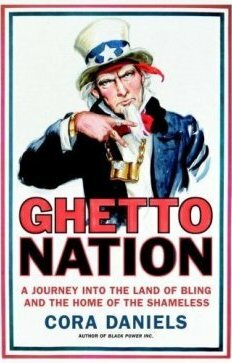 Ms. Daniels, who herself lives in Bedford-Stuyvesant, Brooklyn, argues that ghetto is now a state of mind which has been exported to the mainstream with the help of gangsta rap videos. This entertaining tome is as funny as it is cautionary, points out plenty of indications that you know you've gone ghetto. Some samples include wearing a do-rag to school or court, speaking grammatically incorrect English, sporting gold caps on your teeth, driving a pimped-out automobile, and using the N-word or ho. The author argues that the adherents of this lifestyle are selling themselves short, since one's academic and employment prospects aren't very good when you don't aspire to be the best you can be. Therefore, it's no surprise to hear Daniels side with Bill Cosby against the Hip-Hop Generation in the African-American culture wars, although she makes a point of never blaming the poor for their plight. Thus, she studiously avoids the trap which snares so many conservative pawns seen as stigmatizing those unfortunates trapped in the neverending cycle of poverty. Rather, Ghetto Nation's primary thesis, convincingly articulated, equates ghetto with self hate because it typically inspires those degenerates stuck under its spell to embrace the lowest common denominator and to exhibit the worst of traits found in humanity.